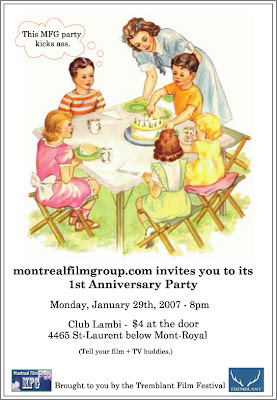 The Montreal Film Group which I co-founded and co-direct with Val Lonergan is having a big party tonight (January 29th, 8pm) at Club Lambi on St-Laurent in Montreal. If you're in the film or TV business, drop on by. UPDATE: The party was a great success! Over 200 people attended and talked each others' ears off. Thanks to Cheskie's Bakery on Bernard and Park for the amazing deal on pastries and to the Tremblant Film Festival for sponsoring the party!